The global market for veterinary therapeutics is consolidated in nature and is predicted to remain in the similar situation in the next few years, states a new market intelligence study by Transparency Market Research. The top ten companies that are operating in the market are expected to account a share of more than 75% of the overall market in the coming years. The leading players in the market are focusing on the expansion of the product portfolio, which is anticipated to generate promising growth opportunities for the market players throughout the forecast period. In addition to this, the rising number of mergers and acquisitions is another key factor encouraging the growth of the global veterinary therapeutics market in the near future. Some of the key players that are operating in the veterinary therapeutics market across the globe are Zoetis, Inc., Bayer Animal Health, Inc., Boehringer Ingelheim Vetmedica, Dechra Animal Health, Virbac S.A., Elanco Animal Health, Merck Animal Health, Merial Animal Health, Ceva Sante Animale, and Vetoquinol S.A. According to the market research study by Transparency Market Research, in 2015, the global market for veterinary therapeutics was worth US$26.9 bn and is projected to reach a value of US$50.2 bn by the end of 2024. The market is estimated to register a healthy 6.70% CAGR between 2016 and 2024. From a regional perspective, Europe and North America are anticipated to witness substantial growth throughout the forecast period. The presence of the leading players and the existence of superior animal health care base are anticipated to accelerate the growth of the North America market in the next few years. In addition to this, the rising trend of the pet ownership and the increasing awareness among people considering the health of their pets are further projected to enhance the growth of the market throughout the forecast period. Furthermore, the rising number of investments and the research and development activities that are being supported by private and government organizations are expected to offer potential growth opportunities for the players in the veterinary therapeutics market across the globe. 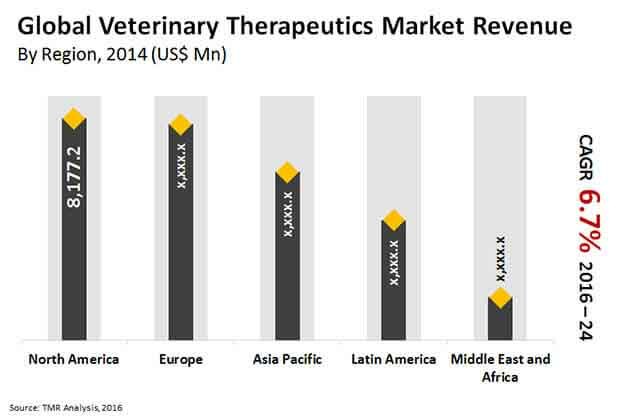 The global veterinary therapeutics market has been categorized on the basis of product type into drugs, vaccines, and feed additives. Among these, the drugs segment is projected to account for a major share of the global market throughout the forecast period. The easy availability of drugs and the growing demand for these drugs for preventive measures against several infectious diseases are some of the major factors that are predicted to accelerate the growth of this segment in the next few years. In addition to this, the growing demand for anti-inflammatory drugs is another key factor, which is projected to enhance the growth of the market in the forecast period. A tremendous rise in the population and the growing demand for food are considered as the key factors that are estimated to enhance the growth of the veterinary therapeutics market in the next few years. The rising preference of consumers for different meat and livestock products is further predicted to encourage the growth of the global veterinary therapeutics market in the next few years. On the other hand, the stringent rules and regulations and the less returns on the research and development activities are projected to restrict the growth of the veterinary therapeutics market in the next few years. Rising development activities and the increasing consumer awareness to encourage growth of the global veterinary therapeutics market in the near future. North America and Europe to witness high growth in the coming few years, thanks to the presence of several leading players operating worldwide.